Envisioning our Future Outdoor Spaces – CONNECT! At Connect, outdoor and environmental education have been embedded in our charter and teaching philosophy for years but many of the outdoor experiences we focus on have been off school grounds. The bulk of students’ outdoor time however, is local. Based only on assumed time spent outdoors at recess, by the end of Grade 9, students will have spent approximately 1800 hours (257 days) outdoors in our schoolyard. Recently there have been many conversations among students, teachers and parents around how we might increase the diversity of our outdoor space for the daily integration of curricular outcomes along with outdoor engaging/creative activity. Towards the end of last year we began the process of pushing these conversations into action by beginning to formalize those conversations and inquire further into how our space is currently being used by students, plant and animal life, and how we might sustainably expand that use in the years to come. We established a ‘schoolyard revitalization’ blog focused specifically on documenting this process and providing ongoing insight into our progress to interested school community members. We also asked students, staff, administration and parents to complete an initial surveying outlining their use of and hopes for our outdoor space. In September of this year we met with staff members from each grade team as well as Michelle Drissler from the Calgary Zoo’s Grounds for Change to review the initial results of this survey and plan for next steps. Some key considerations that Michelle identified we need to keep in mind moving forward are that this process will need to take time and involve as much of the community as possible in order to be sustainable in the long run. As a group, some next steps will be to establish focus groups among student members of the committee and to work directly with Michelle as part of our staff professional development in order to determine how best to integrate the research and development of better outdoor spaces into our day to day teaching. In anticipation of some of the research and conversations that will be undertaken as part of this schoolyard redesign process, one of our Grade 4 teachers Heather Melville took up the conversation of how our outdoor spaces might be used as learning spaces with her class of students. Having recently returned from an overnight experience at Camp Sweet, Heather’s students were confident that all subject areas would be greatly enhanced by the opportunity for immersion in a natural setting and were eager to brainstorm how this might be accommodated right outside our doors at Connect. Here are some of the images and reflections shared by Heather’s students as our school begins the process of reimagining outdoor learning spaces. 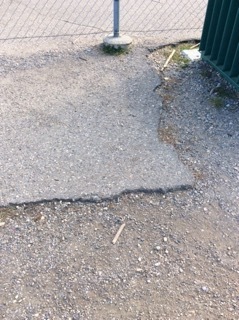 Students identified that the tarmac at the side of the school, extending towards the front entrance really needed updating. 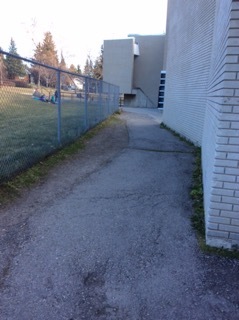 Once they started looking, students couldn’t believe how many bumps, cracks and uneven surfaces covered this space. They also identified a lot of cracks and uneven surfacing around the basketball courts and pointed out that the metal poles supporting the fence and the basketball nets could be dangerous the way they protrude the ground. 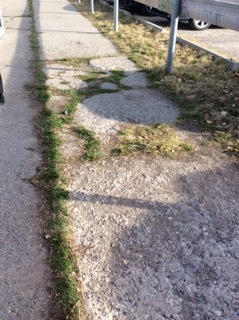 Students suggested that the uneven quality of the tarmac limited opportunity for sidewalk team games like 4-square and hopscotch and would like to see this space re-surfaced to include a pathway system that could even possibly be used for jogging, long boarding and/or cycling skill development. Grade 4 students LOVE our student-designed playground! In particular, they like the range of activities that the space allows for and that so many different activities can be undertaken in the space. The picnic table area immediately adjacent to the playground is also a great workspace but they mentioned that both these spaces are good for physical outdoor activity but not more reflective, mental work because there is so much noise and activity. Students also questioned how we might be able to better develop/maintain the garden in this picnic area. The soccer fields were pointed out as another important open space physical outdoor activities as part of PE, DPA and outdoor recess but students did identify many uneven spaces across both fields that can make running games more dangerous and collect puddles that quickly turn to ice during the colder seasons. This is a space that the students really got excited about. Having identified that some of the things that made their “magic spots” at Camp Sweet so special (the quiet, the complete immersion, the personalization of space, freedom from distraction, closeness to nature), students proposed that this space would be perfect for a garden/outdoor learning space. They mentioned that something that is special about Clem’s Garden (a small alcove of trees near the front of our school) is that it invites exploration. They’d like to extend the space but place it somewhere away from the distractions of more physical activity spaces. They also wanted to include things like fallen logs, tree stumps, moss, tree circles and maybe a garden plot. Other student ideas included wall painting or moss graffiti and window boxes for the classrooms bordering the space. 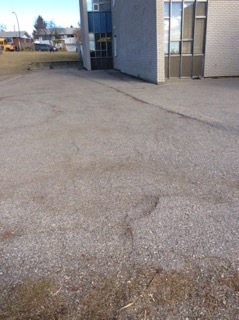 They also suggested that a pathway be built through the natural space to provide access between the front of the school and the parking lot doors and that a permanent ramp be constructed from the parking lot to sidewalk for handicap and any type of rolling cart. 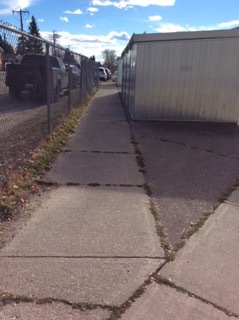 As part of their re-envisioning of the space, students recognized that the storage sheds currently parked here would needed to be relocated. 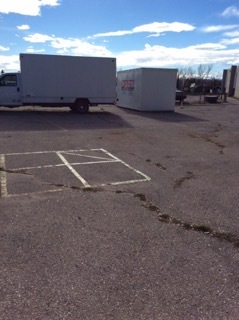 They thought the sheds could move to the currently unused corner of the playing field next to the alley and staff parking lot.